Choose the appropriate description to the breed of the dog. It belongs to the great Spanish family. Its body is of moderate length, strong shoulders and loins indicate of the power to gallop easily. The neck is rather long, muscular, lean and slightly arched. The head is long and lean, with a well-defined stop. The muzzle is moderately deep and fairly square. The ears, set on low, are of moderate length, and hang in folds close to the cheek. The coat is slightly wavy, long, and silky. The colour is white with black. There is no more cheerful little dog than this one, always busy and never bad-tempered. The coat is thick, silky, sleek and lying flat to body. Colours range from black to white. The height is 38-43 centimeters. The tail is docked and carried low. The ears are long, set low and well clothed with hair. The muzzle is well developed and square. The muscular and compact animal descended from large Newfoundland dogs and for nearly two centuries has excelled as a worker and a house pet. Its great trainability made him useful as a guide dog for the blind and for police and guard work. 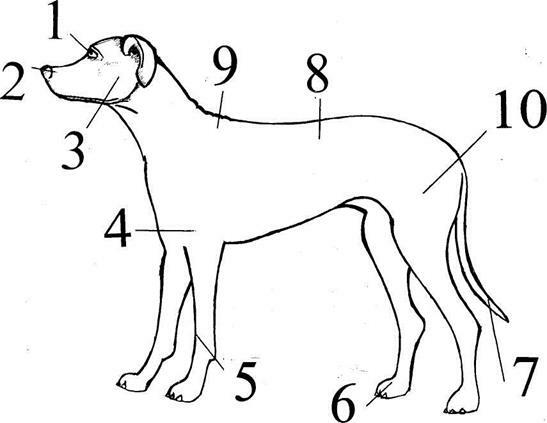 Dogs are 54-61 cm at the shoulders. The short, hard coat turns off water and gives protection from cold, ice and mud. The tail is very characteristic, having a peculiar rounded appearance. It is a very fierce dog. It’s not big. Its nose is short, the under jaw is larger than the upper, which gives it a very fierce look. The dog is very strong. It can attack any animal, even a bull, and this gave it its name. It always aims at the front, and usually fastens upon the lip, the tongue, the eye, or the nose. There it hangs and the bull cannot get away from him. This dog is called so because it can take care of the sheep. If one is missing, the dog runs away at once to find it. It runs about, with its nose close to the ground, for it can smell the track of the sheep. When it finds the sheep, it barks at it, and tries to bite the sheep’s heels. The sheep runs back to the flock as quickly as it can. This dog is useful to man in many other ways too. It helps our frontier-guards to find enemies. During the war it looked for the wounded.